The Banded Demoiselle is a river insect, and it breeds mainly in slow-flowing, muddy reaches of rivers and streams. Occasionally this large and lovely damselfly breeds in shallow silt-rich ponds; we have them in our garden pond along with Common Blue and Large Red damselflies and three dragonfly species. In the summer sunshine there can be few more splendid sights than these delightful insects with their iridescent bodies and elegant wings. The female is similar to Calopteryx virgo, but the male has quite distinctive smoky wing patches. In most fast-flowing rivers there is limited opportunity to use a damselnymph imitation, as the natural nymphs are slow moving creatures. 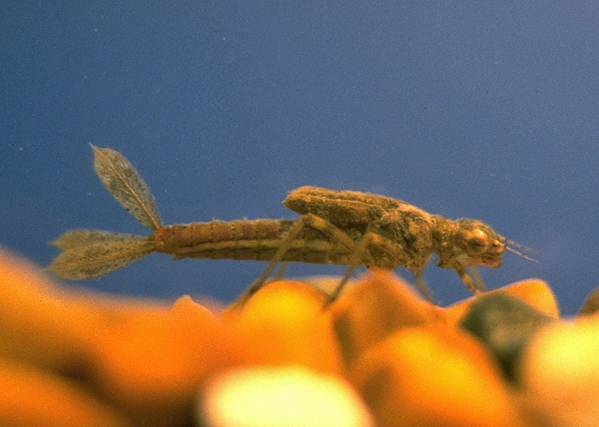 Places where a damsel nymph can be effective include the River Monnow, in Wales, and the River Boyne, in Ireland, Each of these great flyfishing rivers have many slow-flowing stretches where the water drifts along lazily between reed-fringed banks. 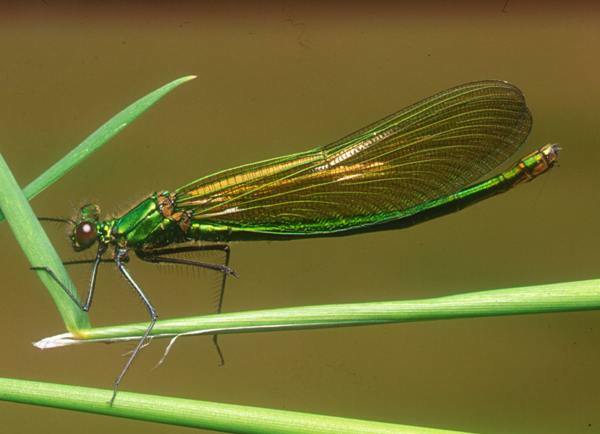 In the reedy areas, where trapped silt builds up and is not swept away easily during spates, Calopteryx splendens, the Banded Demoiselle, lives in surprisingly large colonies. 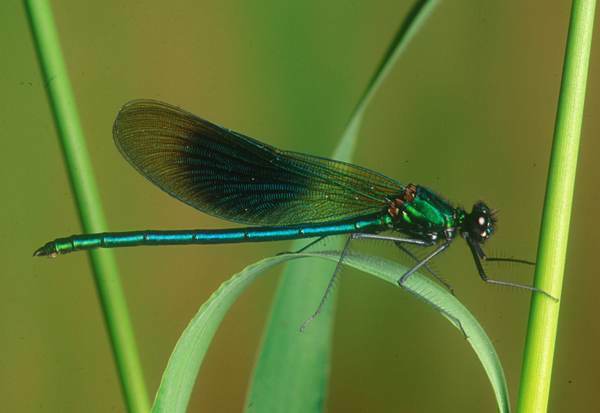 In southern Britain the Banded Demoiselle, also known as the Banded Agrion, is a very common damselfly, but it is found mainly in southern and central England, in Wales, and in southern and central Ireland. Further north it becomes increasingly scarce and localised. There are about forty species of dragonflies and damselflies in the British Isles, although some are now quite rare and hardly ever seen.